Car insurance of VrijVerzekerd repays the purchase price of your car after an accident. So you can buy the same car and keep driving. To illustrate this advantage, Novocortex developed the Endless Racing Game for iPhone, the favourite smartphone of the target audience (men, 25-40, high income, higher education, big cars). It’s the first racing game where game action moves from one iPhone to another. The Endless Racing Game got over 1 million downloads in the AppStore, and achieved the 1st place in the Racing Games category in 37 countries. Watch the campaign video or read the endless story below. To launch the campaign, Novocortex made a video featuring a car race on multiple iPhones. 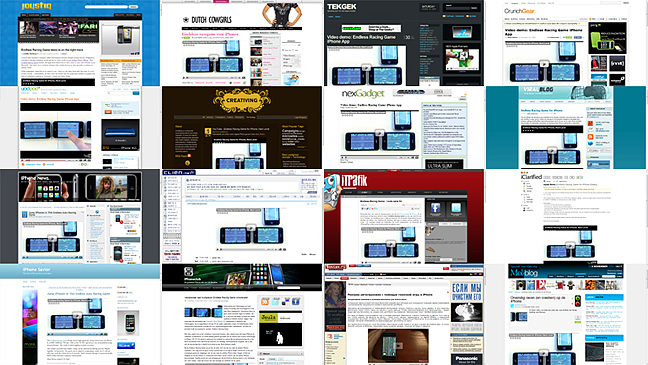 Then, we send a link to our video to tech blogs (TechCrunch, Engadget, Spike, Joystiq). The viral caused discussions if “that kind of multiplayer experience was possible” and drew attention of international media. This way, viewers discovered that the Endless Racing Game was real. And that its innovative gameplay was based on the new peer-to-peer technology of iPhone. Watch the game demo below (or download the iPhone game in the AppStore). The viral video got about 130.000 views and 150 5-star ratings in its first week on YouTube. The video achieved #1 Most Viewed This Month in Holland and #7 Most Viewed This Week Globally in the Gaming category. The iPhone game got over 1 million downloads in the AppStore/iTunes. The Endless Racing Game achieved the 1st place in the Racing Games category in 37 countries, among others: Germany, Japan, Russia, Canada, Taiwan, Austria, New Zealand. And the number 1 spot in the Free Games category in 13 countries, such as Russia, Germany, Hungary, Belgium, Saudi Arabia. The client was happy with the results. The site got 12 times more visitors, over 90% of them viewed the site on their iPhones (if your car crashes in the iPhone game, a button leading to VrijVerzekerd.nl appears on screen). Visitors spent more than 2 min. on the site and viewed 3.4 pages on average. The campaign drew attention of hundreds e-zines and blogs all over the world and reached the first page of YouTube and Google Videos for “coolest iPhone game”, “multiplayer iPhone game” etc. There were 6.500 tweets and thousands results for “endless racing game” on Google. With headlines like: “Endless Racing Game video isn’t endless, is endlessly entertaining“, “Endless Racing Game demo is on the right track” and “Endless Racing Game makes convincing argument for multiple iPhone ownership”. – “Really cool how people are exploring possibilities of these devices. I wish the same excitement was present in things like the htc touch pro 2” (YouTube). The Endless Racing campaign was created by Novocortex in co-operation with Red Graphic. The iPhone application was programmed by ScienceSoft, video production was done by Bullet ICP, music was written by DrumEcstasy. The Endless Racing Game received many awards on international advertising festivals, such as Webby Awards in the US, W3 Awards in the US (Best in Show in the Mobile category), KIAF in Ukraine, Golden Drum in Slovenia. See other award winning campaigns by Novocortex – the viral campaign for Aqua Maris in Russia or our online advertising games for banks and insurances. Read about our iPhone game for men Big Apes Love Blondes.